There are at least five good reasons government should not meddle in the affairs of private free enterprise. There is no accountability because most or at least many of the persons approving a decision to meddle will be gone when the results of the meddling are finally known. There is generally poor education about and understanding of fundamental business principles among those elected to serve in our democratic government. Too many lawyers accustomed to “hours billed” being the most important variable I suspect. There is a strong interest among politicians in pleasing donors and voters, and that interest often trumps whatever knowledge there may be of fundamental business principles. There is a system of lobbying, by people who have great influence over donors and voters, that is mostly hidden and too strongly influences government actions for the benefit of those hiring the lobbyists. And finally, any economic system is complex with many interactions and meddling is just as likely to cause unfortunate unintended consequences as to meet the purported goals of the meddling. The current case in point calling this issue to mind is the so-called Base Load Review Act which became South Carolina law in 2007 and allowed utilities to charge customers for the cost of nuclear plants as they are being built instead of bearing responsibility for designing and building with a good chance of an acceptable return on investment once the plant is producing and selling electric power. So, on the currently abandoned nuclear project in Jenkinsville, SC, nobody was really responsible for success, and expensive failure was the result. A half dozen big companies are involved, and there is lots of finger-pointing. And, the spending doesn’t stop even with the failure. It will cost a couple of billion dollars apparently to clean up the mess. Customers will be charged for that clean up also. I wrote earlier about a fatal flaw in the Affordable Care Act, the Federal Government guarantee of a 15% gross margin to participating insurance companies. It wasn’t stated that way in the legislation. It was stated as a requirement that at least 85% of premiums must be paid out in benefits. But, if I am an insurance company executive with fiduciary responsibility, my interpretation of that is that my company is pretty much guaranteed a 15% gross margin and that it is to the benefit of the company and its shareholders, including those who happen to be policy holders, to maximize customers and premiums and revenues in order to maximize earnings and return on investment. Granted I would have an incentive to squeeze the providers, the doctors and hospitals, but I would share one common goal with them: more spending on health care to have more money flowing through the system, leaving 15% with my company. The ACA is failing in many states, perhaps because the participating insurance companies are finding that the market won’t support premiums that result in the 15% gross margin and are withdrawing from participation in the highly regulated environment that precludes normal competitive activity. Another simple example in the health care industry is the Medicare strategy of paying fixed prices for procedures. For example, if Medicare says it will pay $300 for a certain procedure, the only way for providers to increase profits is to order up more procedures. For many procedures, the major costs are fixed, primarily investment in equipment, space, and staffing, and the incremental cost of an additional procedure, a little electricity and a laundry bill, is negligible. So, the subconscious motto becomes, DO MORE PROCEDURES! So, if I have a bike accident resulting in a bloody face, I am very likely to have to endure a CT scan at government expense. That would not have even been considered twenty five years ago. But those are just examples affecting small parts of the economy. The really big deal in destructive government meddling is with the corporate tax code. The nominal corporate tax rate in the USA is 39%, third highest in the world and ridiculously higher than the global average of 22.5%. Still, that seems pretty simple, but the problem is the thousands of focused exemptions, exclusions, deductions, and credits which result in US corporations and industries with big lobbying budgets and the right connections paying much lower tax rates. 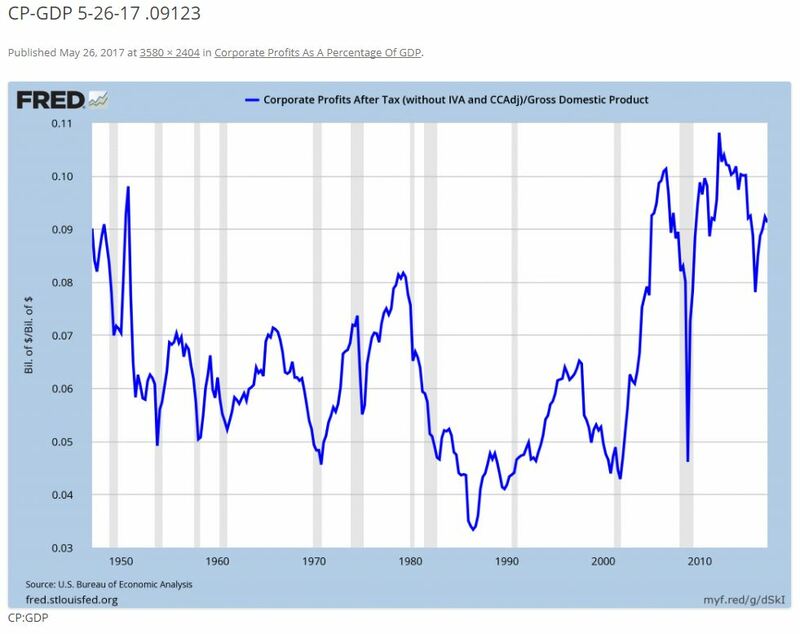 There are two charts at the bottom which illustrate that corporate after-tax profits are running about 9% of GDP in the USA and that corporate tax revenues are running about 3% of GDP. Add the two together and we get corporate before-tax profits of about 12% of GDP. So the effective tax rate is about 25% (3 divided by 12), not too far above that global average of 22.5%. Of course some corporations pay far less and some far more as a result of the game playing required by our law makers. Millions are spent lobbying for those exemptions, exclusions, deductions, and credits, and the distribution of them is not rational in most cases. Plus, the nominally high tax rate results in companies doing whatever they can to avoid reportable taxable profits, often by incurring those profits in countries with lower tax rates. So, here is my idea: stop the meddling for votes and dollars and establish a single corporate tax rate of 22% on reported profits, no special treatment allowed, not even for producers of windmills and solar collectors! And no punishments for producers of coal and plastic bags! 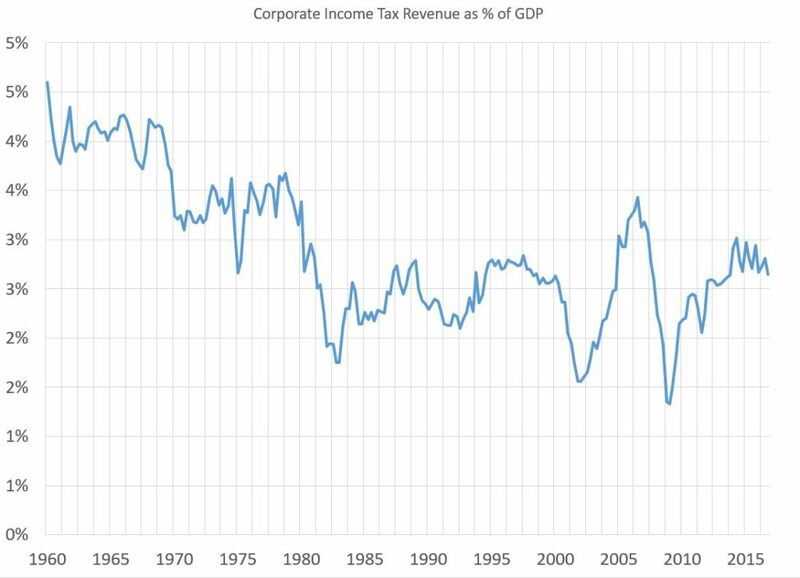 Business investment in the USA would increase and corporate tax revenues as a percent of GDP would increase since there would be less need to try to avoid the taxes and less money spent doing so. Profits, employment and wages would increase. Discontent would decrease. And, we could begin reducing our ridiculous level of debt as a percent of GDP. Here are the charts I mentioned above. Plenty of context here, more than fifty years! Source of the tax revenue data is the BEA NIPA website. Source of the profit data is on the chart, copied directly from the indicated website. The second to the last paragraph make sense. The second to the last paragraph is a great summary of the issue. Thank you.